While most people are familiar with the concept of a desk lamp, few realize just how far desk lamps have come. They are no longer the glaring and bright bulb with one level of brightness and either a pull chain or a toggle for an on/off switch. 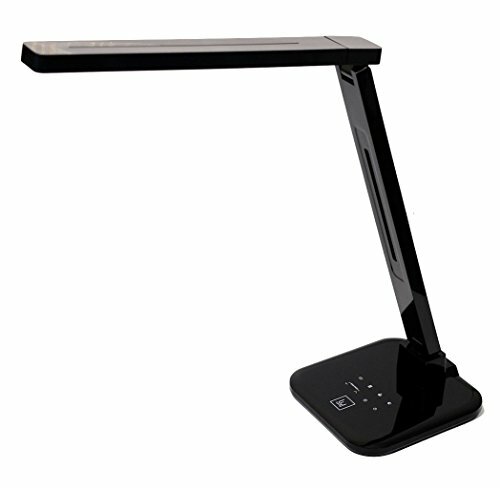 Modern desk lamps can move in almost any direction, allowing the user to aim the light exactly where they need it. Desk lamps that are made today boast a variety of features and conveniences, making it possible for just about anyone to find one that suits their needs. Who Needs And Would Benefit From A Modern Desk Lamp? 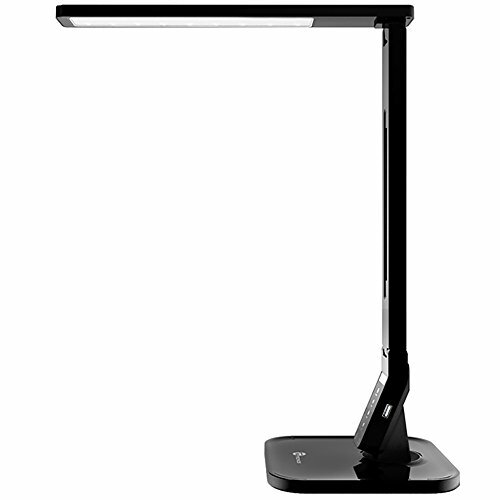 Obviously, Architects would benefit greatly from a modern desk lamp, but also anyone who does a lot of work at a desk obviously would benefit from an updated desk lamp, but they can also be useful for people that routinely read in bed, need additional light for artwork, or need a light source that is sleek and modern looking without taking up a ton of space. They can be portable, cordless, and even water resistant to suit a variety of situations. Desk lamps sold today feature multiple levels of brightness from a soft glow to a brighter light that can illuminate an entire workspace. 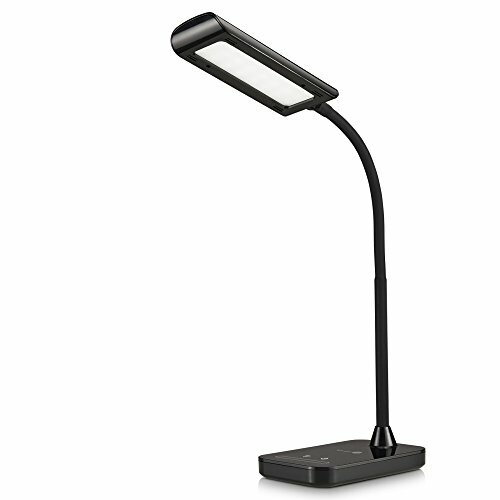 From energy efficient LED lights to USB ports that charge your phone, modern desk lamps offer a variety of traits to make life simpler and easier for students and office workers. One of the areas that desk lamps have jumped forward in is how easily the position can be adjusted. Whether light is needed pointing to the ceiling, straight down or sideways, modern day desk lamps can accommodate. With a slim design that could fit in the smallest of spaces, this lamp boasts five different color modes with seven different levels of brightness. The color mode options are natural light, white, cool white, yellow, and warm yellow. Each color mode can be dimmed or brightened with the slide of a finger depending on the user’s preference. Energy saving LED light is flicker free to ease strain on the eyes. LED lights are also energy efficient and help reduce the electric bill by up to seventy five percent. The base has a USB port to charge any mobile devices, allowing them to stay in close reach while working. This lamp can be positioned in any direction for maximum illumination exactly where it is needed. The head rotates ninety degrees left or right and one hundred and thirty five degrees up or down. It can be folded completely vertically, left at an angle, or positioned horizontally, all while being able to be rotated so the light shines in any direction needed. The gooseneck design means that the entire neck of this lamp is flexible and can be adjusted into any angle that is needed while maintaining its modern design. LED lights save on energy as well as help reduce strain on the eyes, even after hours of reading or working. Five color modes with seven different levels offer thirty five different possible lighting combinations. A memory feature automatically keeps the color mode and brightness that was used most recently. This sleek black lamp with clean lines will fit in with any décor style and offers a fashionable but functional light source. When trying to achieve almost perfect natural light, this lamp really stands out. It has a color rendering index of ninety three, which is as close to natural light’s one hundred color rendering index as possible with synthetic indoor lighting. The result is crisp and sharp lighting to illuminate a workspace or desk. Four different color temperatures and twenty different levels of brightness offer what seems like endless possibilities. Both cool and warm white light are options for this lamp. The base sports sleek captive touch controls to manipulate the temperature and brightness to the user’s preference, as well as a USB port to charge any mobile devices. The lamp boasts an omni-directional pivoting head, which means the user can adjust it into any position desired. As consumers would expect, the lamp uses energy friendly LED lights that reduce utility bills as well as offer longer life spans. The sleek design looks great in any room and can be easily integrated with personal style preferences. With this innovative design, there is no need to find the perfect spot on the desk for the lamp. It easily clamps onto the edge of the desk to create a bigger workspace without sacrificing light. The clamp on design means that the lamp easily works in any space, including the headboard of the bed for nighttime reading. The sleek metal design is completely adjustable to suit whichever angle works best for the user. The head, neck, and arm are able to be independently adjusted to cast light in the perfect spot. The head of the lamp can turn up to two hundred degrees, and the arm can be manipulated ninety degrees. Five color modes and five brightness levels create a total of twenty five combinations, while a memory function remembers the previous lighting color and brightness setting. The unique guide panel distributes light sideways, which creates glare free LED lighting. With a completely unique design, this lamp can be moved almost anywhere it is needed. A continuous oval provides light with no flickering and three brightness controls. Two power sources include a power cord and a built in lithium battery that will last six hours when fully charged. When plugged in, the power cord automatically begins charging the battery so that it will be fully charged whenever it is needed. At just one and a half pounds, it is easy to take this light anywhere. It has a magnetic base that can attach to any metal surface. While it is not adjustable, the convenience factor is huge with how easily portable this lamp is. Also, one button control means that tapping the power button can turn the lamp on and off as well as adjust the brightness. While the light cannot be replaced, it is supposed to give fifty thousand hours of use, which translates to seventeen years if used for eight hours per day. 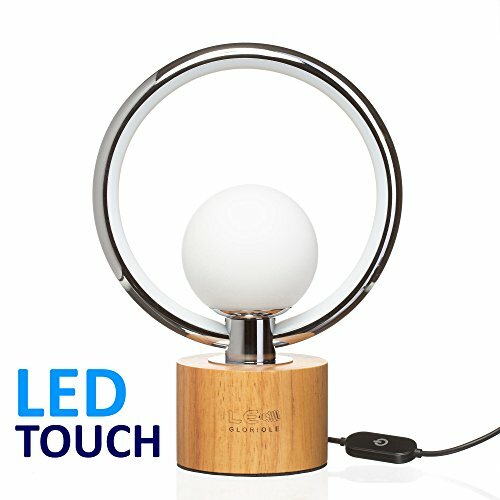 This seems more like a piece of art instead of a table or desk lamp, but it is indeed a unique looking light source. With a single metal rod that spirals upward to approximately seventeen inches tall, it has an eye catching design even when not in use. The entire length of the spiral lights up with a warm, white light using an energy saving six watt LED light source while still being bright enough to do office work or reading. There is only one option for lighting level, however, so it is not possible to either increase or decrease the brightness. There is a two year warranty through the manufacturer in the event that the light does not work as advertised or is defective. 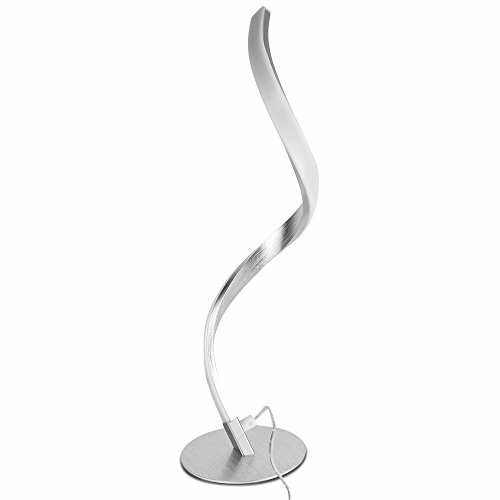 With a sleek brushed aluminum and black design, this lamp delivers in the looks department. It also offers adjustable light levels and extra convenience features. There are three color temperatures and six levels of brightness to adjust to any desired level of activity. The variable light levels are suitable for relaxing, reading, studying, or office work. The light does not flicker and provides crisp light with minimal strain on the eyes. The memory function will automatically set the lamp to the color temperature and brightness it was set to during the previous use. 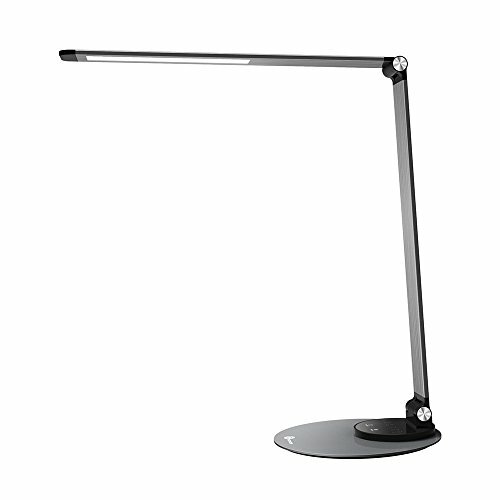 The super sleek and slim arms and stand are completely adjustable so that the light can be aimed in any direction desired. The light portion of the lamp can be extended straight up or down, and the arm can be angled to suit the user’s needs as well. Standing just eighteen inches tall and weighing less than two pounds, this lamp is easily moved from one space to another. A USB port on the base allows the user to charge mobile phones and tablets while keeping them in arm’s reach. This is a cordless, rechargeable lamp with an ultra sleek design that can be adjusted to any position needed. The soft rubber base allows a person to twist and rotate the lamp up to three hundred and sixty degrees in any direction. It is extremely lightweight at just over thirteen ounces, making it an easily portable lamp. The three different color modes are cold, warm, and neutral. Each color mode has six different brightness levels to equal eighteen total combinations. The lamp comes with a four foot micro USB cable, which will charge the built in battery in three hours and provide forty hours of continuous use. While a cable for recharging the lamp is provided, any micro USB cable that charges a smart device will also work. The twenty eight LED light beads provide over fifty thousand hours of glare free light. The lamp produces very little heat, does not emit any UV rays or use any blue light, which can cause eye fatigue and strain after prolonged use. 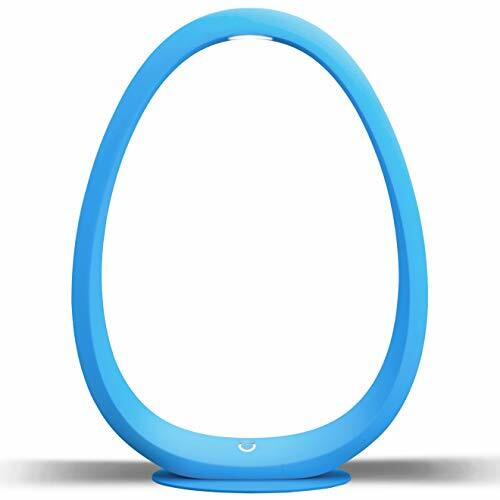 To complete the lamp’s portable nature, it can withstand a one meter fall and is water resistant. These two features make it an ideal choice for a lamp that will be used outside occasionally or even consistently. With an edgy design, this lamp fits nicely into a modern décor with the wood base, white orb housing the light source and stainless steel arc across the top of the lamp. Sitting just ten inches tall, it takes up a minimal amount of space and is ideal for the corner of a desk as well as a nightstand. 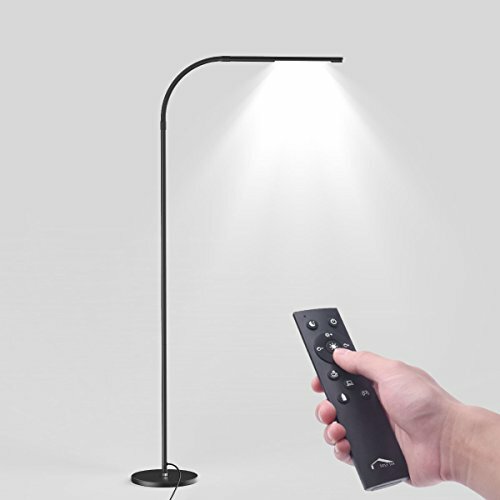 The thirty five inch cord has a touch panel that allows the user to turn the lamp on or off, as well as control the brightness. A long press will cause a gradual dimming between three different brightness settings, and a short press will turn the lamp on and off. A memory function causes the lamp to power on to the previous setting before it was switched off. Multiple users praise it as a bedside lamp due to its shaded light source and soft background glow on the dimmest setting. On a brighter setting it would be ideal for an office or bedroom desk to use while working or studying.